Cerami & Associates provided acoustical consultancy for the auditorium of the Holy Family Church. The auditorium is used for multiple purposes, including children’s activities, guest speakers, religious ceremonies, and theatrical and musical performances. 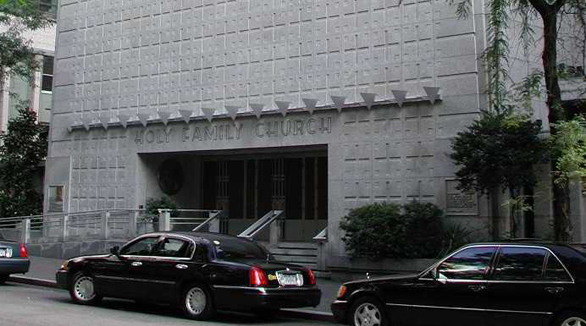 The Holy Family Church requested that speech quality for this facility be improved. Our work on this project began with site surveys of the existing conditions. We measured the reverberation time and the background noise levels with and without the operation of the air conditioning system. We found that because all of the finishes in the auditorium were made of hard materials, sound reflected off the walls and ceiling, created a highly reverberant environment. To improve the acoustic environment, we made recommendations for new finishes in the auditorium. These recommendations included new partitions with sound batting, doors fitted with drop seals and gaskets and acoustical lining for ductwork located in the auditorium. All of these specifications were made regarding new changes the architect had outlined for the space, including the replacement of the drywall ceiling with a wood slat ceiling.